One of the things you often find suggested when you start any kind of new diet is to go to your pantry, fridge and other places you keep food and meticulously go through everything and get rid of anything that isn’t in line with what you’re about to do. That’s all well and good if you live alone or if the whole family is joining your mad schemes. It doesn’t work out so well if you try to do that when the rest of the household really would like to have those potato chips in the cupboard in case they feel peckish. This is where you have to take a firm hold of yourself and develop an iron will power. Learn to say ‘no’ to yourself and to the tasty goodies in the fridge/pantry/wherever. Forget any other advice you read or hear: you are your own most powerful weapon in this battle for weight loss. When I first started this diet I explained it briefly to my husband, who, as the primary cook in the house, was more than happy to oblige my craziness, especially when we both started noticing results. At the beginning, whatever meals we were going to have that day would usually come with a ‘can you have…?’ and either a ‘yes’ or ‘no’ from me. We worked around the things I was avoiding, like if we have a roast for dinner we’d make sure there was pumpkin and carrot on the go so I could have those while he had some potatoes, or if we were having pasta we’d just cook enough pasta for him while I just had the sauce. Now because we did the majority of our own cooking, this was fairly easy, when you or your partner takes charge of your own cooking you know exactly what goes into your meals, so you don’t have to worry about hidden carbs and mysterious numbers. This also means that you’re going to have to take charge of your own shopping and buy whole foods, avoid processed, prepackaged stuff at all costs! Most convenience, prepacked, processed foods contain all sorts of things, from hidden carbs to artificial flavourings, not to mention the amount of preservatives they put into those things to keep them safe to eat for months. I promise that if you severely limit the amount of processed convenience food you consume, you’ll start feeling better regardless of what other dietary limitations you implement. To keep myself in the low carb lifestyle, I’ve developed what I jokingly refer to as a ‘carb paranoia’ – I know, it sounds like a psychological disease or something. What I mean with this is that I’m constantly on the lookout for what’s in what I’m eating; I look at labels, I read ingredients, I check to see that I understand most of what’s written on a packet. The thing is, if you don’t know what you’re eating, how can you even begin to control your diet? And I’m not even talking about a weight loss diet here, I’m talking about healthy eating, an art we are losing. Look at the label here. I’ve pulled it off Google images, I’ve got no idea what it’s from but that doesn’t really matter. I’m sure we’ve all seen these things plastered on the side of a carton of milk or a box of cereal, I’m not sure how many of us have paid attention to them before we started a particular diet. Our primary focus here is the carb number. 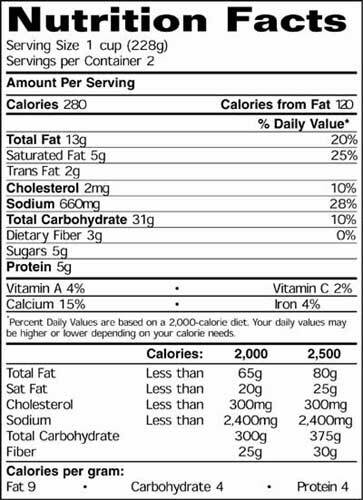 So it says ‘Total Carbs – 31g, Dietary Fibre -3g, Sugars -5g’ and we need to know what the net carb count is so we can figure out whether we should be having it or not. Well, easy enough: 31g total minus 3g fibre = 28g of Net Carbs. A little too high for my count at this point in my diet, but it might suit someone else’s plan, great. Now, have a closer look at some of the other numbers. The sodium’s a little high at 28% of the recommended daily intake don’t you think? And uhoh, there’s some transfats in there too! Maybe we should keep looking along the shelf for something that’s a little cleaner. This is the label off of a can of a popular brand of soup. If we look at the label closely we can see there’s a whole variety of not-so-hidden carbs in there: bread crumbs, all that flour, at least two types of sugar, juice concentrates, milks, pasta, and a few weird science words we don’t even know the meaning of that could contain who knows what. Now, I’m not saying look up every ingredient on a can of soup before you eat it, that’s going a little overboard: this lifestyle isn’t suppose to drive you to the brink of suicide, it’s meant to be helping you achieve your goals. What I am saying is BE AWARE OF WHAT YOU’RE EATING (and drinking! ), become a conscious consumer: check the labels of what you’re buying, hop online and research the fruit or veggie you’re about to consume – nowadays that takes seconds so don’t pretend like you’re going to starve if you take that extra minute. The sooner you take charge of what you’re putting into you, the sooner you can take charge of your weight loss. And that’s enough preaching from me for the day.